If you ever find yourself driving to/from your job or your home and suddenly something is wrong with your engine, you will need to contact a local Arizona mechanic to check what happened and help you with a quick fix. 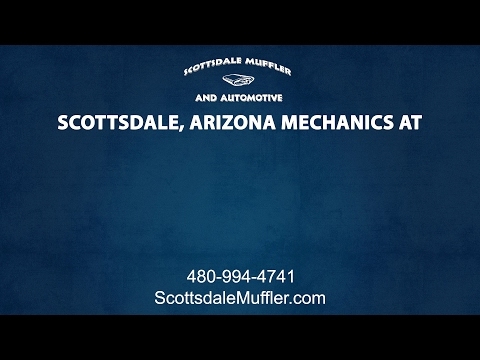 If you are around Scottsdale or surrounding areas, Scottsdale Muffler and Automotive have your back. With a team full of skilled and qualified Scottsdale mechanics, we guarantee to repair and maintain your vehicle with the finest quality and care your car deserves. Besides repairing engines, our Scottsdale mechanics also do transmissions, brakes, and basically all the parts of your automobile. Rest assure, we have the experience and knowledge required to work with almost all car brands. With Over 80 Reviews in Yelp, Facebook, and Better Business Bureau, we prove our commitment to our clients, guaranteeing the best service and customer service on the market. As professional Scottsdale Mechanics, our promise is to bring you the fastest response so you can be on your way as quickly as possible, without wasting time. We are not only specialized in repairs, but also in improving your vehicle with oil changes, transmission flushes, tire rotations, tune-ups, and more! Our goal is to provide our customers a service that lets them have a durable, long-lasting lifespan on their car without worrying about their automobile’s health. We are more than happy to be with you every step of the way with you, with explanations whenever you want more information. When you need complex car repairs, or even routine repairs or maintenance done to your vehicle, you want to be sure you have skilled and qualified Scottsdale Mechanics that can perform these repairs and services with the utmost quality and care you deserve, at an affordable an competitive price. Engine and transmission repairs as well as parts replacements need to be done correctly and efficiently the first time, as to save you hassle, time and money in the long run, so being certain you have the best experienced mechanics to do the job is necessary. Here at Scottsdale Muffler & Automotive you can be sure that we will give your vehicle the proper repairs and maintenance, as well as other services you need to get back on the road and carry on with your daily routine! Finally Found A Shop For Me! Working in all Scottsdale and surrounding areas, Scottsdale Muffler & Automotive has the perfect team for your vehicle needs. We take pride in everything that we do, and with just a call, we will be wherever you are, as fast as we can. You can get in touch with us at (480) 994-4741 to find out more information about all our services whenever you want. Better yet, why don’t you call us right now and say hi! Including advanced Auto Repairs, and new part installations we offer quality routine services that keep your car running and driving as it should. From oil changes, and transmission flushes, to tire rotations and tune-ups, the all around quality of service provided by the knowledgeable team of Scottsdale Mechanics here at Scottsdale Muffler & Automotive make it our goal to have the best in customer satisfaction! Aside from repairs and maintenance, our mechanics specialize in Custom Exhaust Systems. Not only will this help enhance the performance and power of your car or truck, but it minimizes pesky engine noise and provides convenience to your vehicle. We offer the best materials and parts available in the state of Arizona, and can work with you to determine the best Custom Exhaust System for your vehicle. If you are in need of Scottsdale Auto Repair or vehicle maintenance, let the team of trained and certified Mechanics staffed at Scottsdale Muffler & Automotive show you what quality car service is all about! When looking around for car repair shops in Scottsdale Arizona be sure that you look for one that is family owned and operated as well as one that’s been in the business awhile. A shop that has been around for several years or decades will have the experience and dedication needed to take care of your vehicle quickly and efficiently.In many cases car repair shops that are family owned and operated are more trustworthy than those that aren’t. The simple reason for this is the fact that a privately owned shop will take more pride in their work and value their reputation much more than the workers who work at a corporate repair center. Written by our expert mechanics at Scottsdale Muffler & Automotive in Scottsdale AZ. Schedule an appointment with our experienced Tempe Arizona mechanics for muffler repair and/or exhaust repair. If you are currently living in Arizona and your car isn’t preforming at it’s best, you should look into finding an auto repair shop. If you have any questions or concerns, here are a few frequently asked questions regarding our work here at Scottsdale Muffler and Automotive. Our Scottsdale repair technicians will fix any car, domestic or foreign, at an unbeatable price!